In this Circle, using the energies of this powerful Full Moon we will work with the teachings of Prosperity and Abundance master teachers who have left us a rich legacy of knowledge and wisdom. e.g. Paul Solomon, Catherine Ponder, Wayne Dyer and many others. You are invited to join Sharon as she guides you through a Journey to Release what is no longer working in your life. You will start the process of being open to welcome and receive abundance and prosperity into your life for a year filled with all you deserve and desire. This is the third in a series of three Abundance Meditation Circles. Please note: Each Circle stands alone and the teachings are individual in order to support you as you work with Guided Meditations, Essential Oils, the Chakras and personal Affirmations to support you in reaching your Life Purpose, your goals and your dreams. Release and Remove any Ancestral Karma blocking your creativity and abundance. Work with your Divine Team, Ascended Masters, Angels, Guides etc. to release negative energies and allow the flow of positive supportive energies. Change the neuro pathways of the brain to ACCEPT & RECEIVE abundance. 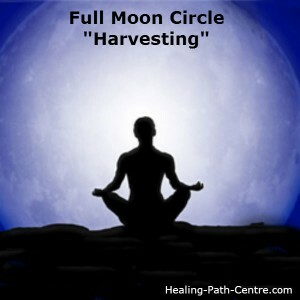 Full Moon energies support us in Releasing and Harvesting for a creative, heart focused and abundantly prosperous life and the energies of those in the Circle serves to support each member towards realizing their dreams and goals. Circle will be held in Newmarket – Venue given to attendees only. Yesterday night was magical. I feel so much lighter today as well. Wonderful stuff. Thank you. Hello Dora. Sorry about the late response to your wanting to subscribe to my web site. Please subscribe by clicking the link on the website and typing in your information.